Our new 13 4 Piston rear brake kits feature powdercoated 2-piece billet aluminum calipers with hard anodized aluminum pistons, full 2-piece rotor 13 vaned, drilled and slotted rotors, fully machined billet mounting brackets that install the calipers as well as incorporate an internal drum in hat parking brake design. DOT-approved dual seal piston seals making these kits fully street able and perfect for track use as well! These kits are complete and available for 10 bolt, 12 bolt and 9 Ford rear ends. 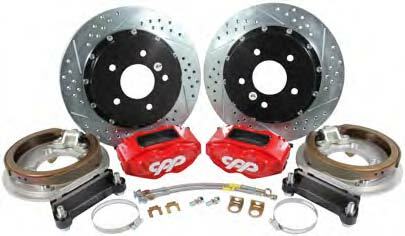 Available with black or red calipers.